I was still in diapers back when Billie Jean King beat an aging Bobby Riggs in 1973, so I don’t remember much of the struggle that female tennis players endured to get as much recognition for their efforts as their male counterparts. But by the time I was a budding sports fan, women’s tennis was one of the few places where women enjoyed, if not pay equality, at least their fair share of media attention, TV time, and respect. With the men’s and women’s Grand Slam tournaments taking place together, I was just as likely to catch Martina Navratilova on TV as John McEnroe, as likely to watch Steffi Graf dominate an opponent as I was Pete Sampras. Which made it all the weirder when I read that the revered Stade Roland Garros, which first hosted a national women’s tennis tournament in 1897, had turned a court bright pink and set up an on-site salon and spa for female sportswriters in honor of “Ladies Day.” Joanne C. Gerstner has all the details of Ladies Day in her tragi-comic post at ESPNW, complete with tales of her manicure, blowout, and pink champagne. 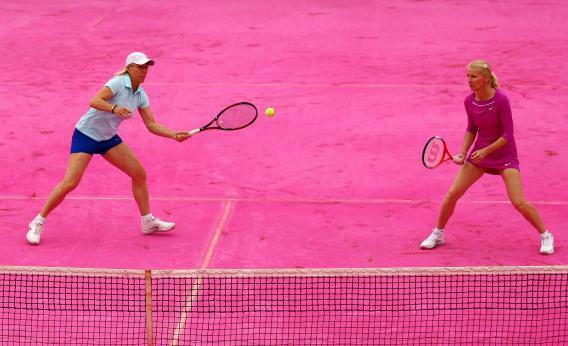 I doubt that the pointless frivolous spectacle of Ladies Day will bring actual harm to the sport of women’s tennis, unless someone suffers burned retinas from looking at that pink court all day. But that doesn’t make it a meaningful gesture or something that will help women anywhere. We must remember that female athletes are still struggling for equality in many sports, but tennis isn’t one of them. And where women athletes are fighting for equality, they won’t be helped by manicures and pink champagne.